A fully-online auditor training programme, accredited by IEMA (Institute of Environmental Management and Assessment. AuditMentor training is the fastest, most cost effective route to an accredited auditor certificate – which is recognised around the world. The course provides clear, expert guidance on the ISO 14001- 2015 standard and the requirements of performing an audit. The course features six multimedia modules, each one comprising of around 60 interactive slides – providing an enjoyable and effective training experience. Tracked quizzes will help you to monitor your own learning and will be fed back to our support team – who will be with you every step of the way. As well as excellent online and telephone support, expert guidance is available from our course author John Marsden, a Fellow of IEMA and registered lead auditor with more than 20 years of experience in the field. Learn ISO 14001 training online in your own time. Scott took advantage of taking two courses with AuditMentor – augmenting his Health & Safety skillset with an additional course in the ISO 14001 Environmental Management Standard. This gave him an extra CV boost which he believes gave him the edge when securing his new position as Health & Safety Assistant for the European Space Agency based in Darmstadt. Module 1 – Introduction to the course. Why conduct an EMS audit? 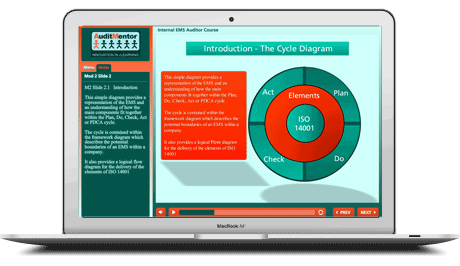 Module 2 – Understanding ISO 14001 Planning Elements. Once payment has been received, we’ll send you an invite to this course’s six online modules. It’s easy and quick. If you have any queries, just send us an email and we will get back to you promptly. We also have an ISO 14001 checklist available for delegates to use.